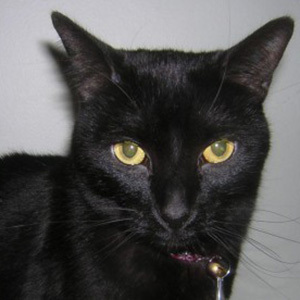 Marsha describes Bella as a very mild-mannered and intelligent kitty who truly loves people. She has demonstrated her smarts by learning to shake hand to paw, as well as learning the “sit”, “stay”, and “come” commands. According to Marsha, Bella is a real talker when she gets to know someone. North Star Therapy Animals has many special teams, but being a registered therapy cat makes Bella pretty unique. Together, Marsha & Bella visit through Catholic Eldercare as well as Fairview Home Care and Hospice, bringing special smiles to hospice patients. Though her therapy animal status makes Bella pretty unique, she is, after all a cat – so her favorite activity during time off is sleeping, of course! Bella loves to spend time out on the family’s three-season porch, watching the squirrels and rabbit activity outside. She also loves to be carried around over Marsha’s left shoulder.